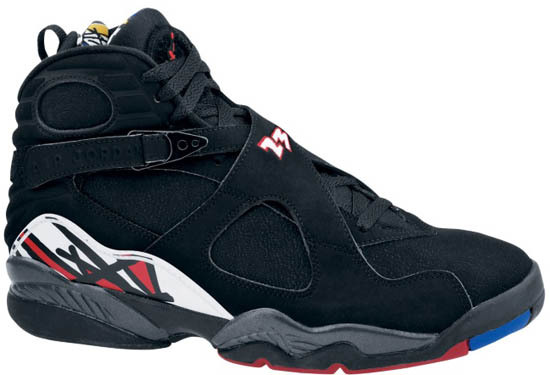 Previously retroed in 2007, the original "Playoff" colorway of the Air Jordan VIII is one of a few pairs set to release in 2013. Click here to grab a pair on eBay. While the Air Jordan V and XIII are confirmed to be releasing next year, more word has been spreading around lately of the Air Jordan VIII will be returning as well. Colorways rumored confirmed to release so far are the original white/black-true red, a new "Phoenix Suns" themed colorway and, the original "Playoff" black/true red colorway. The white/black-true red has been retroed two times so far and if it returns in 2013, it will mark its third retro release (previous was 2008s Countdown Pack). For the "Playoff's," it will be its second retro release, six years after it's first retro release of 2007. While the rumor is they will be a June 2013 release as of right now, it is not 100% confirmed. However, once I find out official info I will be sure to let everyone know. For now, check out my 2007 Retro of the "Playoff" Air Jordan VIII Retro below and if you're interested in adding these to your collection, click here to buy them on eBay.